I've had very little time on the water for the last month or so, and I was really looking forward to wetting a line on my home-turf River Wye over the Christmas break. 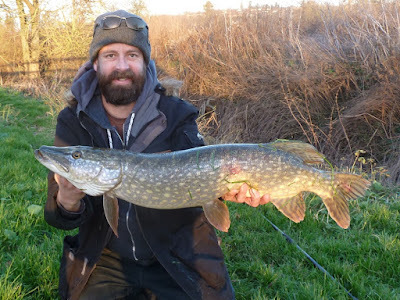 So despite being full of cold I thrashed the water to a foam lure fishing for 5 hours on Christmas Eve, I could watch the lure right across the river in the clear water - and despite being really happy with how I fished I couldn't provoke a follow let alone a take. Nice '16 pike; hope to see bigger, better ones in your '17 reports... All the best for the New year! Cheers Ollie, one last shot at a '16 big girl... If not I'll have to get one next year. Happy New Year! Yeah really tough, and we haven't got the floods as an excuse! I couldn't even get follows so you're doing better than me. But it's always nice to get a double on the bank. See you bank-side!